As most of you know, I am autumn obsessed. Can't get enough of it, could live in this season year round, would decorate my home in its décor month after month...you get the jist. 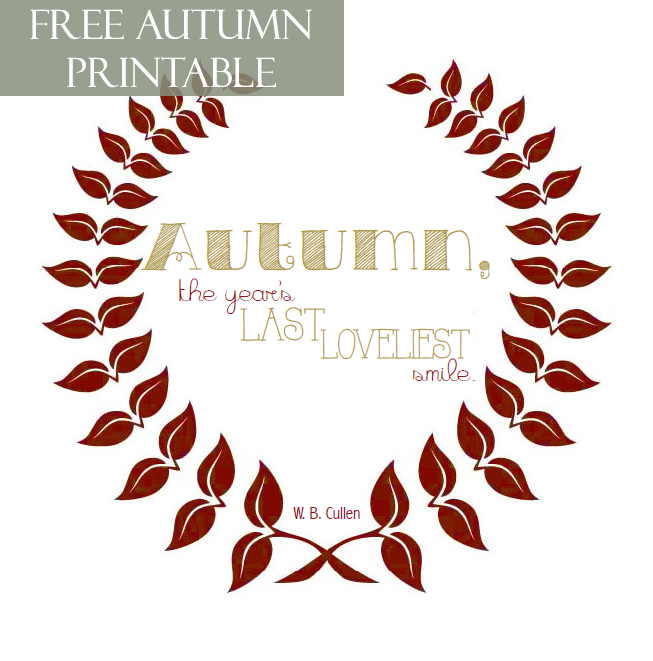 So, in honor of my GREAT love for this beautiful and crisp season, I thought I would try my hand at making a printable for YOU! Something that was fall-inspired and would make for a lovely addition to any fall décor. The best part, it's FREE! All you have to do is click on the link given below and print it. It's sized to be a 4x6 print so that you can slip it into a photo frame. Set it atop your table, hang it from your wall, however you feel like using it is up to you! The only thing I ask is that you contact me before using it or offering it to others on your blog. And if you share it, make sure to link back to Hill Collection. If this printable works and goes well, then I'm want to try out more designs to share with you. Leave me your feedback, so I can learn the do's and don'ts of making printables. I hope you enjoy!! And don't forget to enter the GIVEAWAY!! It ends tonight at midnight! The Nuts & Spices KIND bars are so good AND healthy! P.S. Go check out the Bourbon Blueberry & Peach Cobbler recipe on Flour Darling today; it's to die for!